Another quick post of some interesting data concerning the explosion at the fertilizer plant in Texas. Yesterday (4/17/13) there was a large explosion at approximately 7:50 pm local time. As of early this morning reports showed around 179 people hospitalized, 24 in critical condition, and 5-15 fatalities. Currently 3-5 firefighters and one law enforcement officer are unaccounted for. Over 60 homes were damaged by the very large blast. The best video I've seen so far is attached below, the explosion happens around 30 seconds in. Also below is the initial emergency services traffic. Finally, we can look at data from the Amarillo seismic station (US.AMTX). I've pulled down the data and filtered it to show all frequencies above 1Hz. We expect the explosion to produce mostly high frequency signals and attenuate, or lose strength, quickly (why I didn't see the explosion on any other stations such as US.WMOK in Oklahoma). It looks like there are 6 main pulses of energy (possibly tanks failing?) very quickly and the large explosion in a period of around 10 seconds. 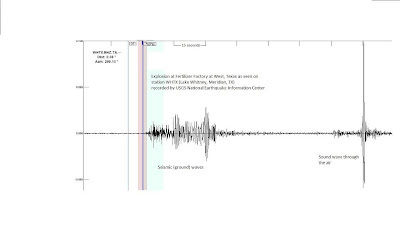 EDIT: The USGS posted a transportable array station that was closer to the event (seismogram below) that shows both the fast ground waves and the slower air blast. They classify this as a magnitude 2.1 event on the event page, but it's really a larger explosion than that hints at as magnitude is only based upon ground motion. This morning Oklahoma experienced another small sequence of earthquakes. (There was also a large earthquake with an estimated magnitude of 7.8 in Iran over night.) While I'm preparing for a conference very soon I'm a bit crunched for time, but thought a short post would be in order. I would like to write a few posts concerning what magnitude is, how we calculate it, and other common questions I get asked at some point in the near future. Okay, here's the synopsis of the most recent events. Early this morning at 01:56:29.875 CDT a magnitude 4.7 earthquake occurred centered northeast of the Oklahoma City metro area. There have been a few significant aftershocks at magnitude 3.0, 3.6, and 4.6. It is notable that there was a higher number of seismic events (though all small) beginning yesterday. All these numbers are from the Oklahoma Geological Survey, the USGS estimates are lower with the largest events at 4.3, 4.2, and 3.3. 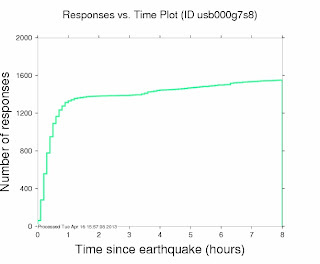 These magnitudes are computed on slightly different scales, but either way the largest earthquake released over 10 times LESS energy than the earthquakes last year. 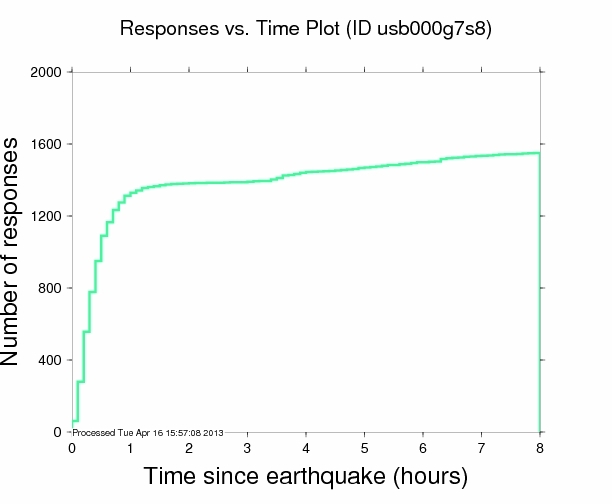 The USGS did you feel it program has already collected around 1600 responses and the shaking reported matches very well with what was expected, probably due to the DYFI scale being pretty accurately calibrated after the large earthquake sequence last year. It was striking that the vast majority of the responses came within 90 minutes of the quakes indicating the people actually got up and reported as soon as the event was over. These responses really help the folks at the national earthquake information center (NEIC) and if you felt the earthquake but didn't go fill one out you should! The moment tensor solution of the earthquake shows a strike slip solution meaning that the rock moved laterally past each other, not up and down. This is shown by the "beachball" below with the colored regions indicating areas of compression. 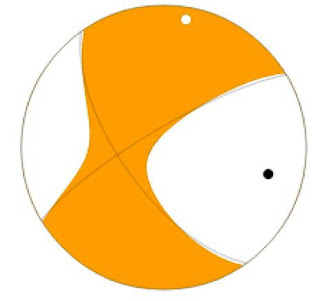 There isn't enough information from one earthquake alone to tell if the fault runs SW to NE or SE to NW, but based upon the distribution of the large aftershocks it would be an okay initial guess that the fault trends to the NW. Also notice the solution isn't perfectly strike-slip. There is a small amount of oblique motion with a thrusting sense. After inspecting the infrasound instrument I have in my office I didn't see the earthquake, but the ground motion wasn't really detectable on the seismic station in Standing Stone, PA either. It looks like the infrasound may have recorded the Iran earthquake, but I need to move it to a less noisy location. Just for fun I've thrown in a seismograph below from a station in the Wichita Mountains in SW Oklahoma. It would be fun to calculate the different arrivals and plot, but that's more fun for another time! I've made the trimmed .SAC file is available here in case you want to download it and try.